Parents need to distinguish between normal childhood spats and acts that cause severe harm. Q. My second-grade son is complaining that a few of his classmates are bullying and excluding him at recess. I’m friendly with their parents. Do I bring it up to them? I don’t want to hover or to risk the friendship. Kara: I feel you. You want to bust onto that playground and tell those meanies to be nice to your baby. The instinct to protect our kids from hurt is so primal, no matter how old they get. Once they hit school, there’s less we can do to keep their worlds safe. It’s a rite of passage for kids — and for us parents, too. Today’s parents are going through a period of “heightened awareness” around the concept of bullying, says Dr. Peter Raffalli, the director of Boston Children’s Hospital’s Bullying and Cyberbullying Prevention and Advocacy Collaborative Clinic. More awareness is beneficial in many ways, but it also requires parents to distinguish between normal childhood spats that will resolve on their own, and severe harm, which warrants intervention either by school administrators or among parents. Raffalli says that true bullying is “repetitive, mean-spirited harassment where the victim cannot troubleshoot it,” as opposed to one-off quarrels or insults. The key is to determine which is which. David: Talk with your son to make sure you understand the full picture. Deana Criess, director of the Anti-Bullying Program at ImprovBoston, emphasizes the importance of asking your children for details and finding out if it’s ongoing or a one-time incident. If it was a one-time thing, “ask what happened before and immediately after. How did your child respond?” Knowing what motivated it can help you understand whether to pick up the phone, or to let it play out and see if the kids can resolve it. Often, they can. Before a pattern of behavior emerges, your child may be able to change things. “It’s scary for kids to talk directly, to say, ‘I really don’t like the way you’re treating me,’ ” Criess says, “but more than 50 percent of the time, if they do, it ends there.” Sometimes kids just don’t realize the harm they’re doing, and a simple nudge like that fixes things, whereas using words like “bully” and “victim” can exacerbate the problem. “Those labels stick,” she says. 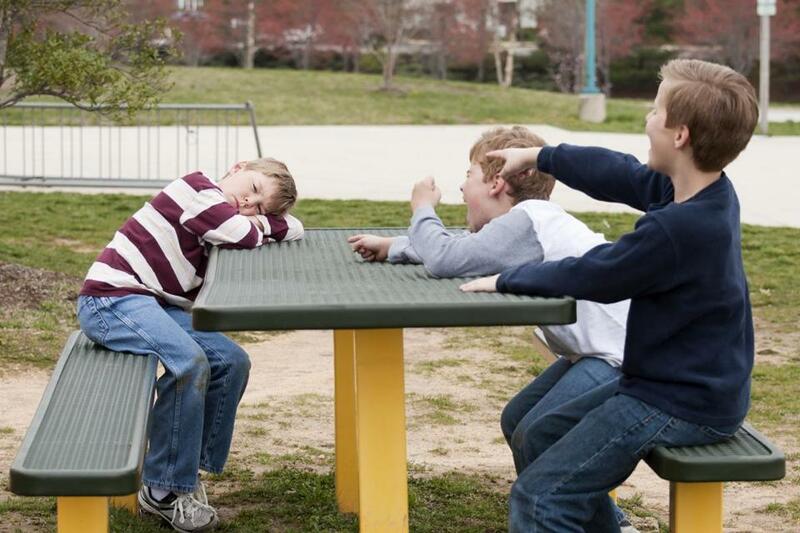 Escalating the situation by throwing the “bully” label on another kid makes mending their friendship difficult, and could follow the other child. Kara: If your child is an ongoing target and can’t resolve things on his own, Raffalli suggests involving school administrators or teachers instead of taking matters into your own hands with their parents. “One of the things we tell parents is to establish a safe person in school, somebody on staff who the child feels comfortable going to,” he says. These people should be able to deftly intervene (making sure the kids aren’t placed in small groups together, keeping an extra eye on recess) without making the bully feel “told on,” which might only perpetuate the behavior. On that note, parents are more of a variable: Some might be able to handle the situation well, but others might either lash out at you or lash out at their child, which could only escalate things on the playground. Speak to them as a last resort, and diplomatically. Raffalli suggests phrasing things this way: “I hate to bring this up, because I don’t want to sound accusatory or overbearing — but Jack is feeling like Joey is picking on him. Could you ask him? He likes him, and he’s coming home a little sad.” Starting out angry will only trigger the other parents’ defense mode, just like on the playground. David: I really do think it’s your worst option. If you go to the other parents, even with the most careful and constructive approach, be ready for them to see it as an attack. Be wary: That’s how blood feuds start in classic drama. Send your parenting questions to globe.parenting@gmail.com.